Hello my Pretties (Get it?? "My Pretty".....from the Wicked Witch in the Wizard of Oz??). Long time no see. I'm such a disaster pants! Really and truly. I haven't made anything this year! Except of course the million and one things I made for my Brother's Wedding....which I have still to show you! But on the bright side, I got published in a Wedding Magazine....Yippee!!!!! Well, my Brother and his lovely new Wife were in the magazine but my blog got a mention as I made everything for their big day. So I'm very chuffed to see my wee blog in glossy print. I promise I will have photo's of some of the things I made, but because I had so much to make, I forgot to take photos of a lot of the things I made. So I'm in the process of trying to gather photos from friends and family who wisely did take photos! I'm such a numpty! You'd never believe I was a Blogger! "Look at this fabric I found. 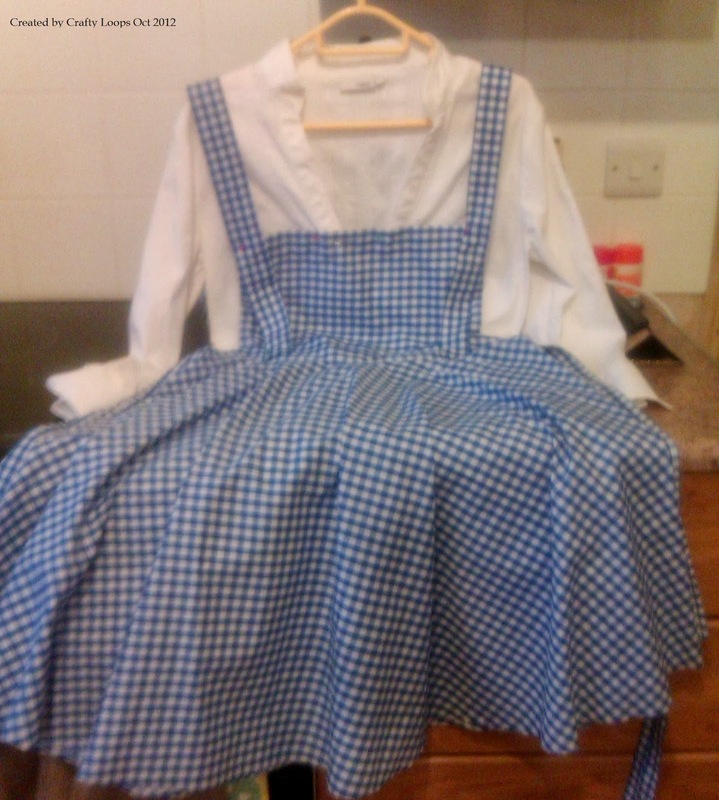 Its really cheap and I bet it would make a really great Dorothy Gale outfit for me for Halloween. I'm sure it would be really easy to make and it would be cheaper than buying the outfit from the Halloween shop". Now......Here comes the complicated bit. T doesn't own a sewing machine. In fact, I'd be amazed if T has a needle and thread in her possession. And she has NO sewing machine skills whatsoever. Don't get me wrong, I'm not attempting to slag my sister off or insult her in any way (she knows me by now, lol). I'm in the same boat, haha. However, I DO have a sewing machine AND a needle and thread, BUT like T, I also have NO SEWING SKILLS WHATSOEVER!!!! And I'm not being modest here when I say I have no sewing skills. I honestly don't! I took a fancy one day and decided I wanted a sewing machine (just one of many whims). Christmas came and Scrubby Loops kindly bought me said sewing machine.....and that was it......there it sat, gathering crafty dust and taking up space on my floor. And why? Because I'm 33 years of age and have never even plugged in a sewing machine in my life! The last time I used one was when I was 12 years old in Home Economics class. But because I had been off sick with the flu, I was behind in the sewing class so I managed to give big Doe eyes and a pouty lip to my HE teacher and she pretty much made my wall hanging for me. So to say that I have no sewing machine skills at all would be a MAJOR understatement. "Ohhhhhhh thats a great idea, but I think I can find the fabric cheaper. I'll have a look and get back to you. I'll also see if I can find any tutorials on how to make this outfit and we can have a play with my sewing machine". How do I get myself into these things?? I'm telling you, I sometimes take my role as a big sister too seriously, lol. And those little suckers of siblings of mine have me wrapped around each of their little fingers......and thats 4 little pinkies to be wrapped around! That's a lot of wrapping, lol. Ack well, what else are big sisters for, eh? Here it is! 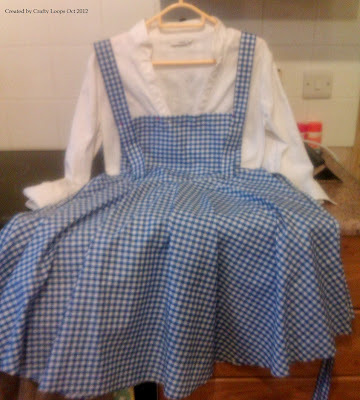 Dorothy Gales dress. It has a simple white shirt style top under it (which I didn't make....obviously) and has a beautiful belly band that goes around the waist and ties in a pretty big bow at the back. There were 2 big white buttons added where the strap meets the front but they were added after the photo was taken. The skirt part of the dress is a circle skirt and I even put in a zip!!! A ZIP....can you believe it? Ok, I put it in upside down, lol....but come on........that's a pretty damn fine dress for someone who has never sewn anything in her life and the zip may have gone in wrong, but it was perfectly sewn in, lol. The dress still worked though, regardless of the upside down zip. I like to think of it as a quirky Loops touch, lol. It's certainly one of a kind.....Move over Dolce & Gabbana. My sister is pretty tall. In fact she is the same height as me (how, is a total mystery considering our parents are wee short arses...sorry Mammy & Daddy, but you are, lol). So at a lanky 5Ft 8", she doesn't like wearing tall heels as she doesn't like to tower over her fella. Total opposite of me of course.....I'd have been wearing 6" heels with no concern of who I was towering over, lol. Anyway, I managed to find an old pair of reddish coloured kitten heels that I bought years ago and never wore (because they were too low, lol). 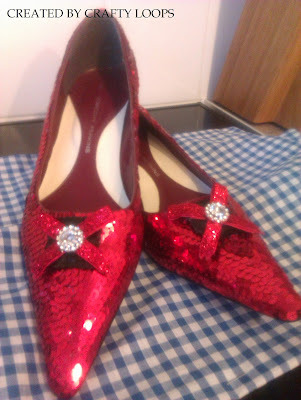 To decorate them, I bought red sparkly sequins trim off ebay. So, these sparkling beauties were made by hot gluing the sequins trim round and around the shoes. 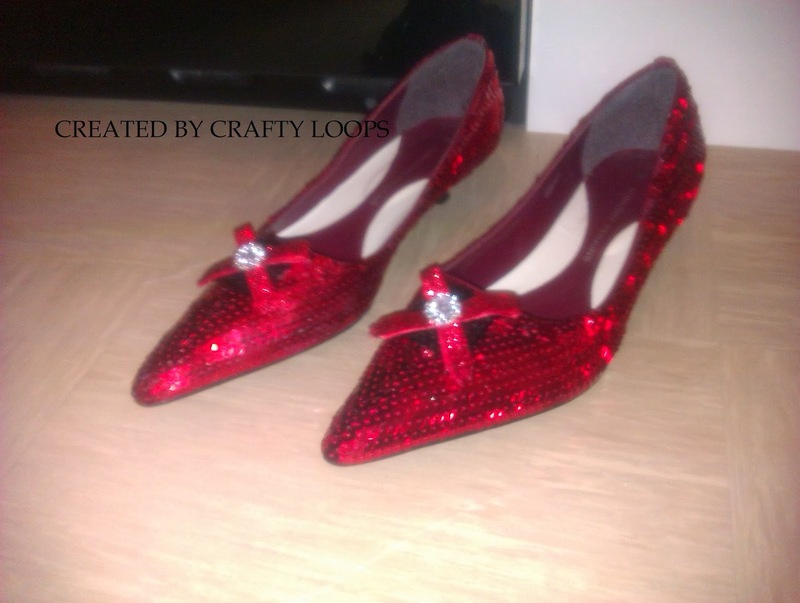 I started at the top back seam of the shoes and went from there, working my way around and down the shoes. I had to ensure that each layer overlapped the prior so there were no gaps. Any little gaps that did appear were simply filled in by cutting off individual sequins and gluing them over the gap. 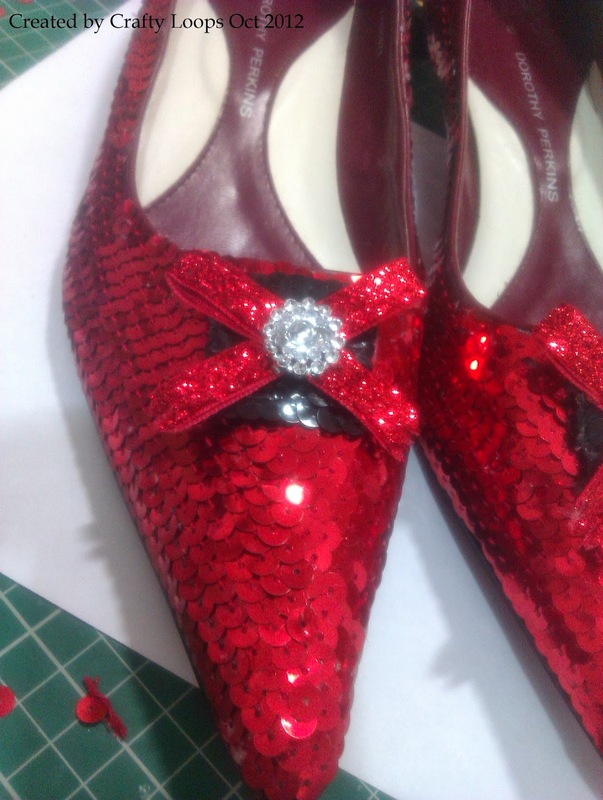 I made the shoe buckles using black sequins, added some tinsel like ribbon made into a bow and glued on one of my wee blingy buckle sliders to the centre. They look incredible when the light hits them. I wish you could see them in real life. Look at those beauties sparkle. So pretty! Sorry there are no photo's of T wearing the outfit, but she didn't want any photos taken until she had her whole get up on, including a brown plaited wig, make up AND her tiny miniature Jack Russell, Luna, in a basket. Yes, she was putting her dog in a basket. So, I have asked for the last year for photographic evidence of the whole outfit......and I'm still waiting. Oh the cheek, lol. 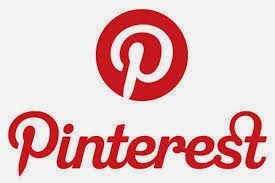 And as I always round up my blog posts....that's it from me folks. I will try to be a better blogger, I promise. I'm still destashing and doing out my room, so I will have more things up on Ebay soon. Oh and I still have to do my Freebie Frenzy too. I have stuff that I don't want to bother putting up on ebay....all perfectly good crafty bits and bobs. But its a mix of this and that and its too much bother to list on ebay. So, provided you are happy to pay the postage costs.....I'm sticking them onto a blog post and offering them for free on a first come, first serve basis. I will do a "Heads Up" post letting you know the rules and giving you an idea of when the Freebie Frenzy will be posted. Also, I may be doing a Miss Congeniality Giveaway very soon too. If you have no idea what a "Miss Congeniality Giveaway" is, check out near the bottom of this post for details.